MrTitanium: Item: Tall Diamond Titanium Earrings w/ovoid void. 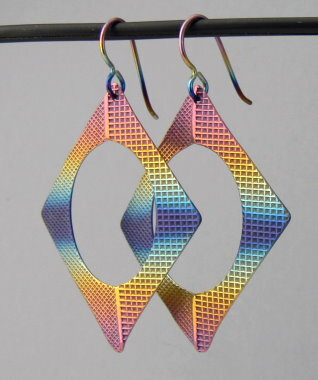 Dia15: Tall Diamond Titanium Earrings w/ovoid void. These larger Diamond Titanium Earrings have organically non-linear edges and an oval opening. The different embossed textures on each side add depth. Light weight and eye-catching, plus hypoallergenic. Rainbow may vary.